The Road Scholar program finished yesterday, and since I was taking a red eye flight home, I had all day to explore on my own. 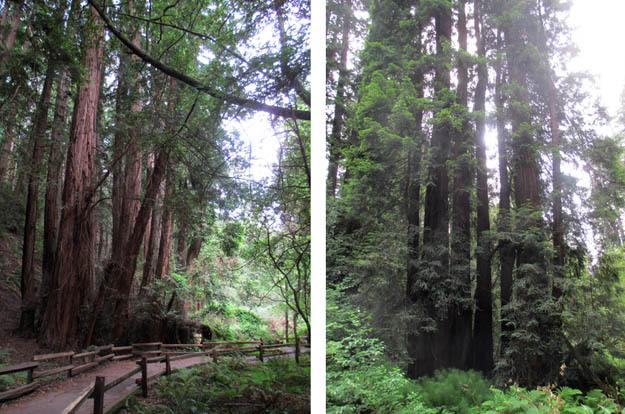 I began the day with a tour to Muir Woods which took me by bus over the Golden Gate Bridge. 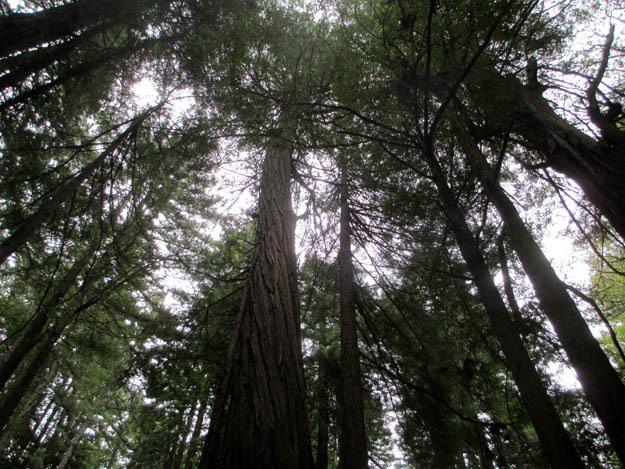 Muir Woods is a National Park with trails through tall, very majestic old redwoods. The ground was covered with a lush array of ferns and sorrels and pre-historic horsetail plants. After spending time poking around the shops in Sausalito, I returned by ferry to Pier 39 in San Francisco to view the sea lions. These sea lions made their home along the coast and just days prior to the earthquake of 1989, they disappeared. 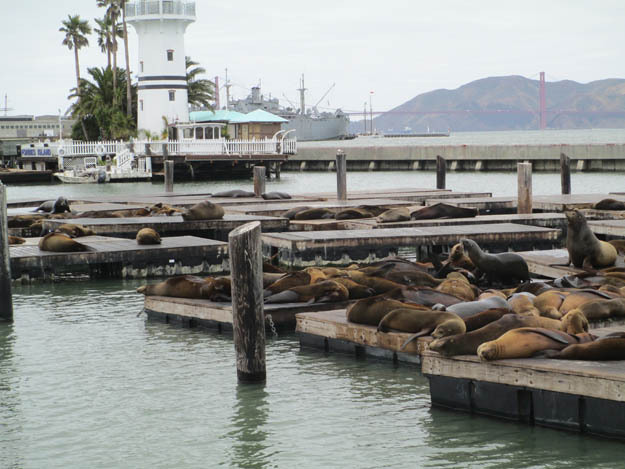 Then a few days after the earthquake they appeared and made their home at Pier 39 and have been their ever since attracting hordes of observers. 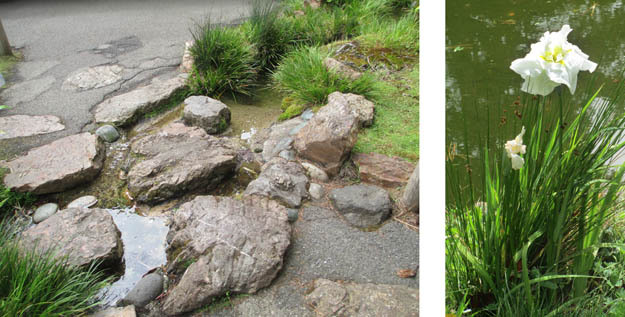 My final adventure was to visit the Japanese Tea Garden in Golden Gate Park, the oldest public Japanese garden in the US. 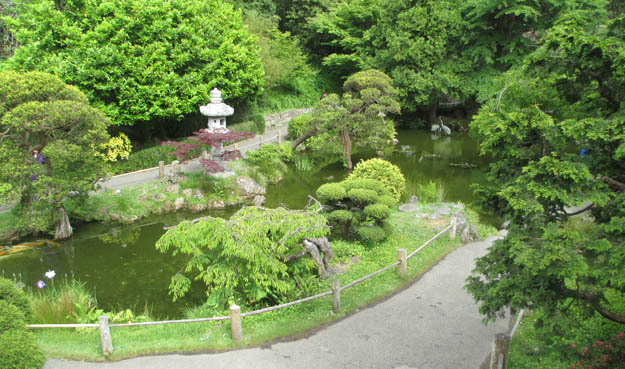 Created in 1894, the garden features a moon bridge, a tea house, pagodas, stone lanterns, stepping stone paths, native Japanese plants, koi ponds and a zen garden. Because the garden is more than 100 years old, the trees are very tall and mature and remind me of gardens I have visited in Japan unlike some of the newer gardens in the US. 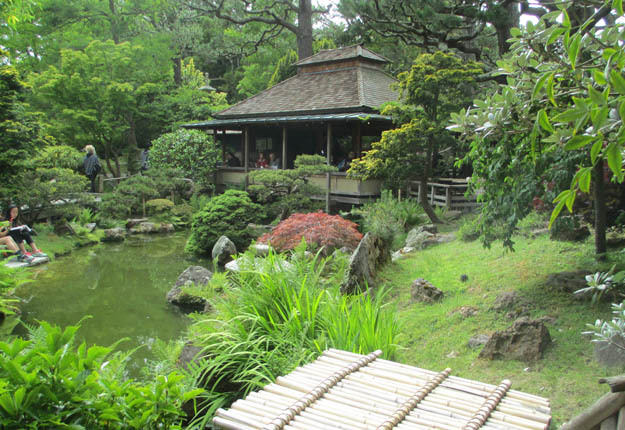 The visit to this serene garden was a nice way to finish my time in San Francisco! 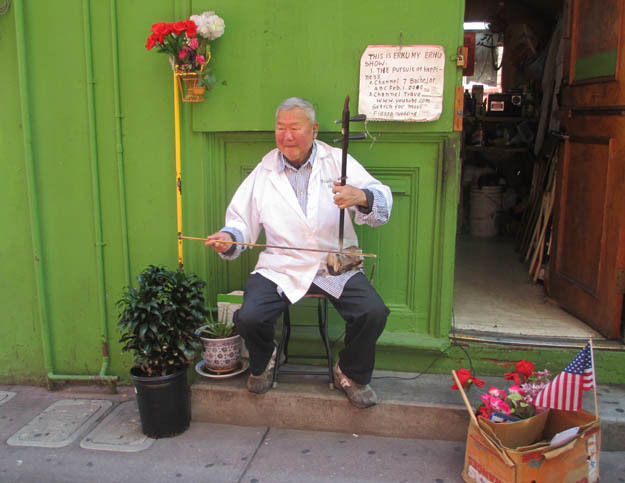 This entry was posted in San Francisco 2017 on May 28, 2017 by JWH. Here are some views of this incredible place. 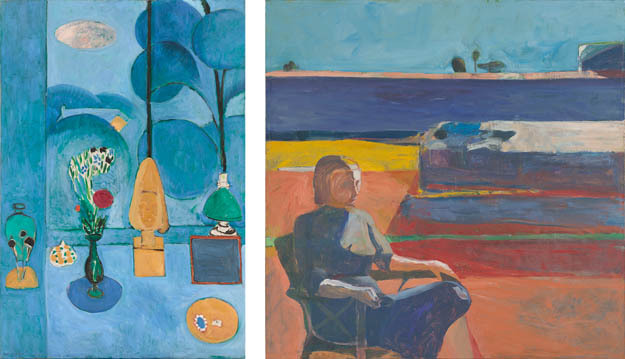 For my free time afternoon, I visited the San Francisco Museum of Modern Art where the special exhibit featured the influence of Matisse in the work of Richard Diebenkorn, a Bay Area artist. Even though I purchased tickets that allowed a limited number of people to enter the exhibit at a given time, it was packed. So packed that it was a hassle to view the work! 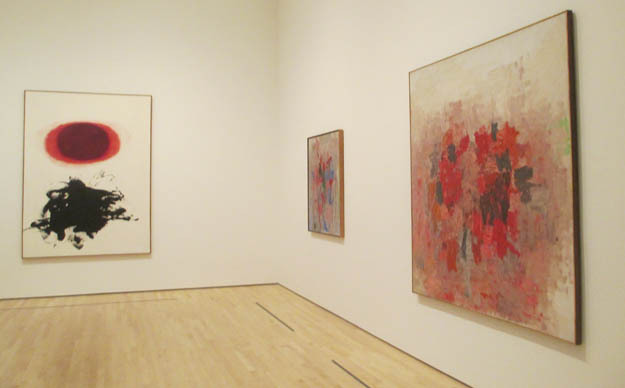 I viewed my favorite works, and quickly headed to the fairly empty galleries in the rest of the museum with its outstanding collections. 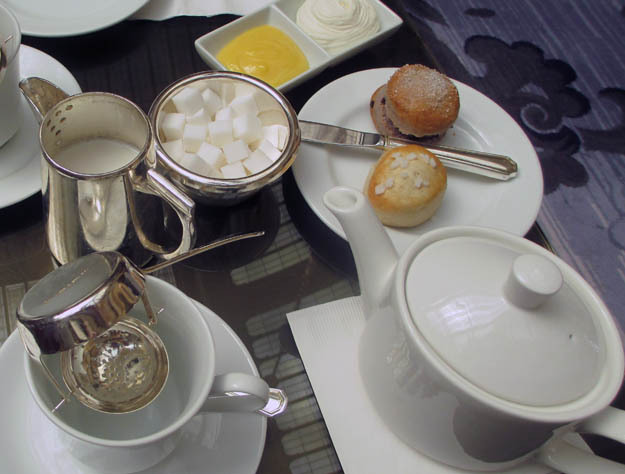 On the way back to our hotel, Mary and I stopped for tea in the Garden Court of the landmark historic hotel, The Palace Hotel. 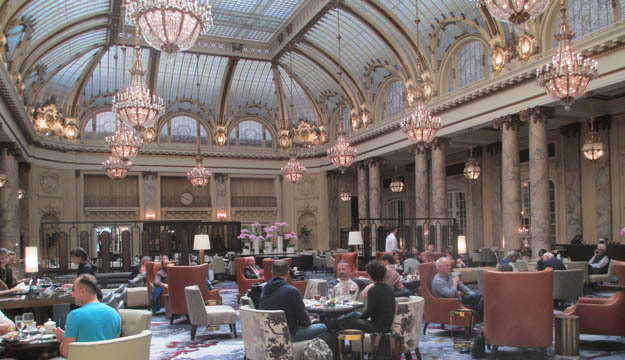 This famous, elegant and sumptuous, hotel takes up two city blocks and replaces the original hotel that was lost in the 1906 earthquake. 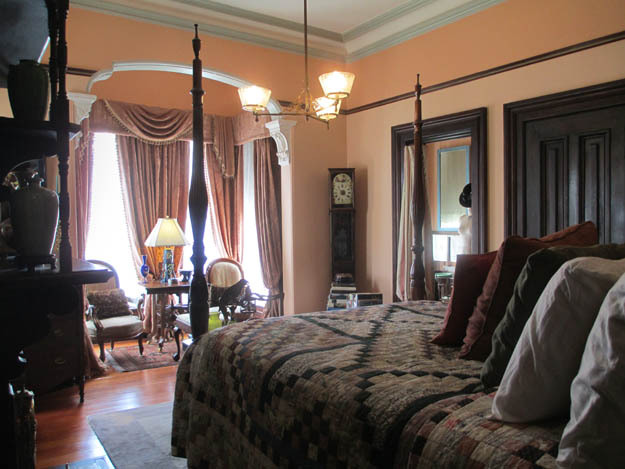 The “new” hotel was built in 1909 and is reported to be less extravagant in decor than the original. 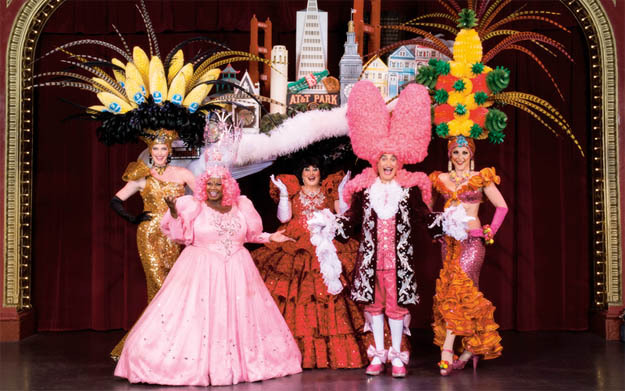 The day wrapped up with the group attending Beach Blanket Bingo, the world’s longest running musical revue with great singing, wild costumes and outrageous head gear where the cast acts out social and political satire and the audience loves it! We began the Day 3 by traveling form our hotel down the hill on a cable car – for the fun of it! We then visited the Cable Car Museum to observe the cables that are constantly running underground to keep the cars moving. While the cables are moving, a gripman uses a lever to grab the cable and the car moves. When he releases the lever the car stops. It is a simple mechanism that takes lots of maintenance since the cables fray and need replacing and the gripper on the lever wears out. There are eight different cable car lines and each has its own, constantly moving, cable. 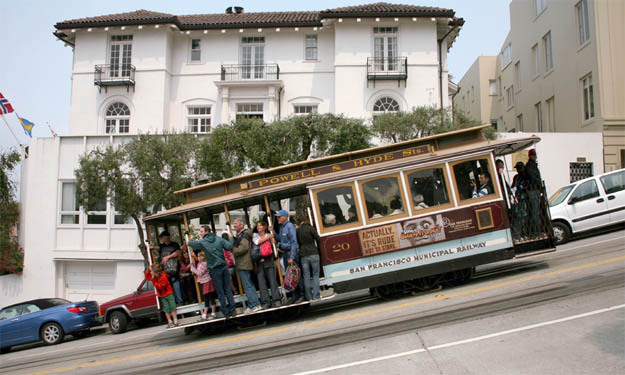 The cable cars date from 1873 and enabled the city to expand up the steep hills, hills that were treacherous for horse and wagons. 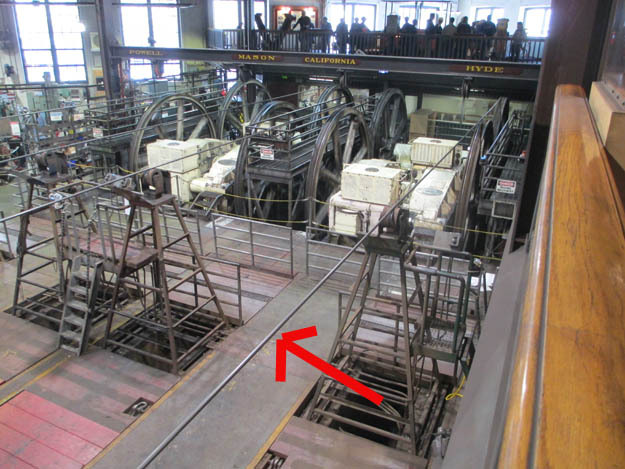 The red arrow above is pointing to one of the constantly moving cables. Below is the device that grips the cable. 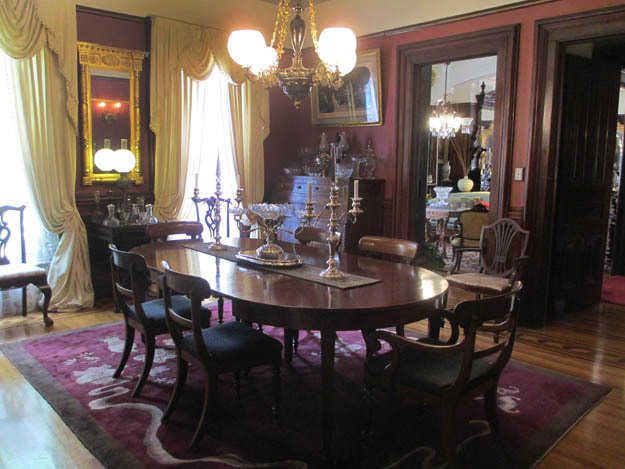 We then learned about some of the mansions that occupied Nob Hill but were destroyed in the 1906 Earthquake/Fire. 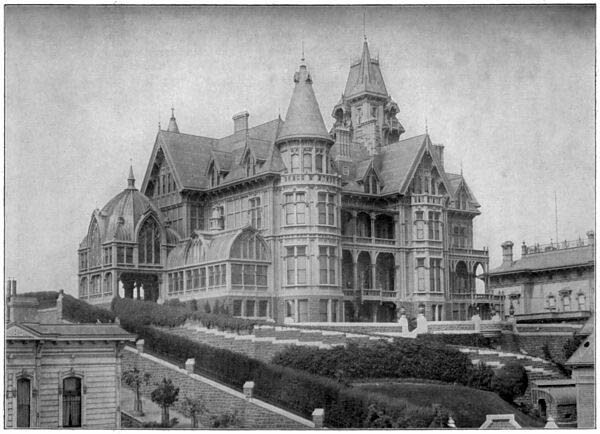 The largest was a 127 room Victorian built by Mark Hopkins, one of the “Big Four” very wealthy men who financed and created the Central Pacific Railroad. The railroad became the western part of the First Transcontinental when it linked up with the eastern part in Utah in 1869. 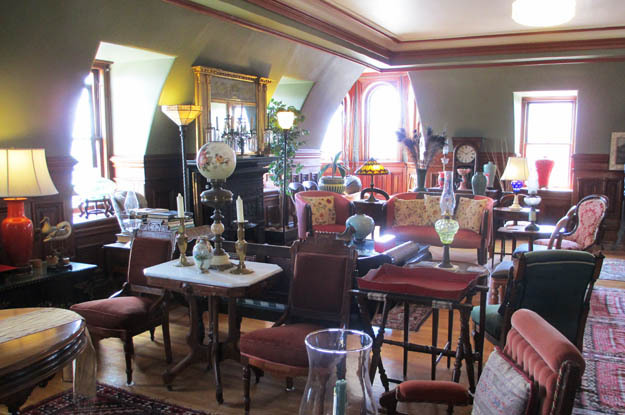 Below is what the mansion looked like. A hotel now occupies the site. 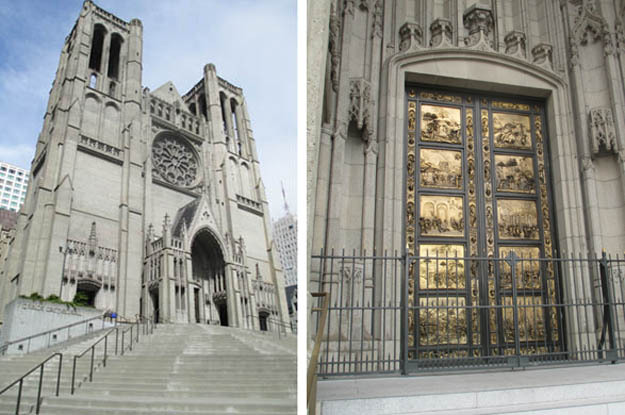 We visited Grace Cathedral also located on Nob Hill. Construction began on the church in 1927 and was completed in 1964. 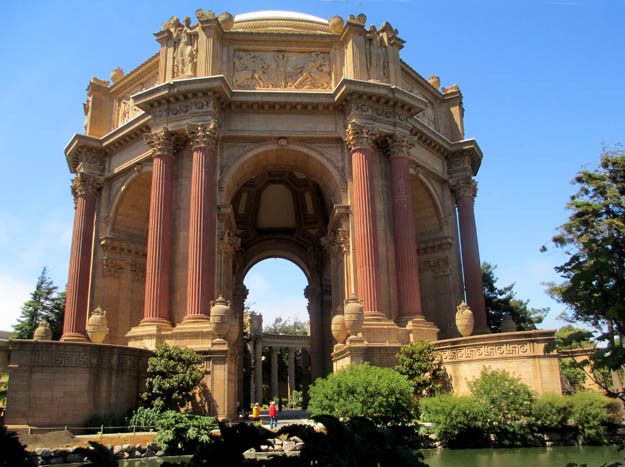 It replaced one destroyed in the 1906 earthquake that dated back to the Gold Rush of 1849. The main doors of the Cathedral display a replica of the 15th century Gates of Paradise by Lorenzo Ghiberti that are on the Baptistry of the Cathedral in Florence, Italy. 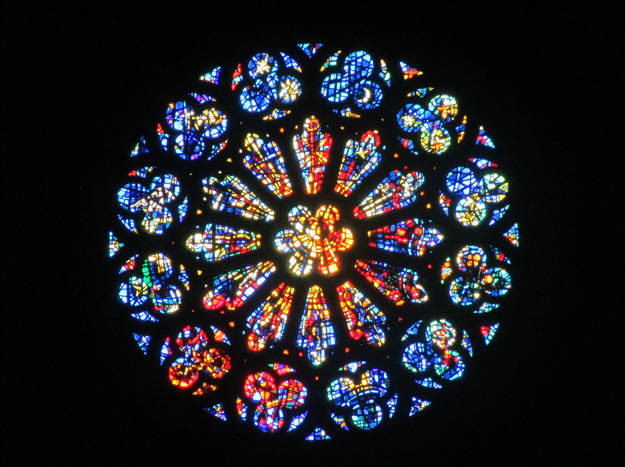 The Cathedral is the third largest in the US and has gorgeous stained glass windows. 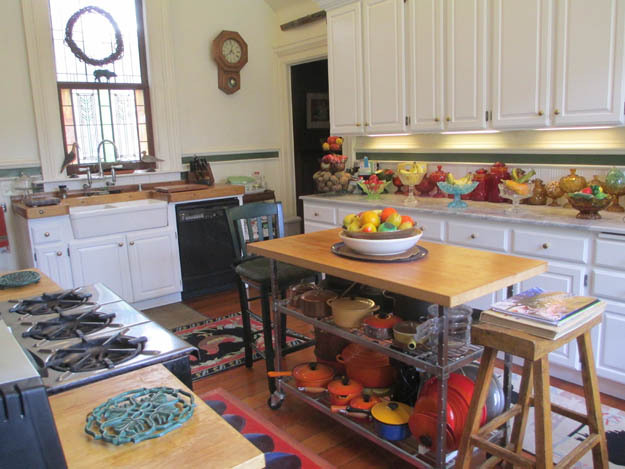 The church supports and promotes various arts events including an annual artist residency. 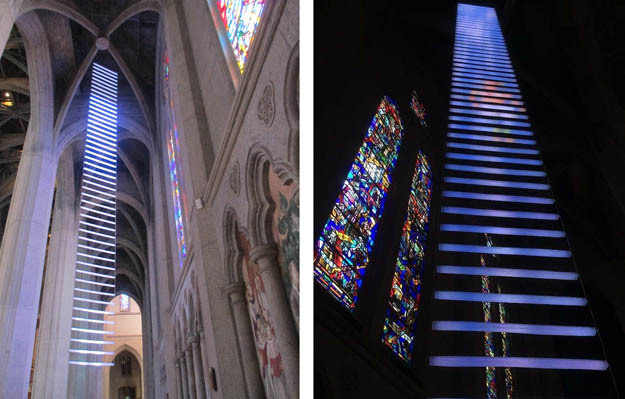 Installed in a side aisle of the nave is this years project by Benjamin Bergery and Jim Campbell, entitled “Jacobs Ladder.” It consists of a ladder of light tubes with a changing pattern of colored lights that depict a figure moving up and downward that reference a passage in Genesis where Jacob has a dream where he sees angels descending and ascending a ladder to heaven. 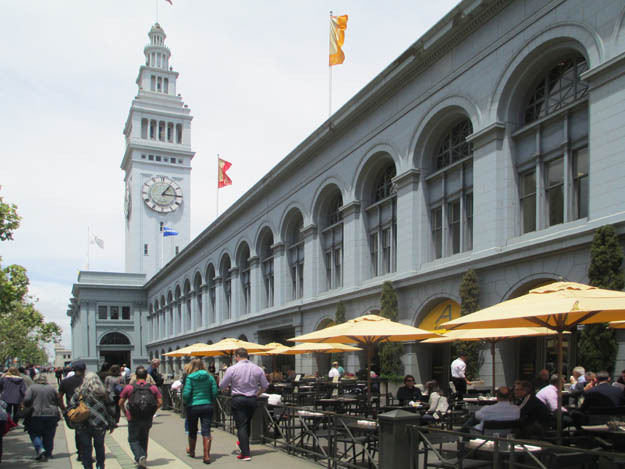 The Ferry Building on the wharf is one of the few buildings that survived the earthquake and fire of 1906. The building covers three acres and was the transportation hub for ferries until the 1930’s when the bridges were built to accommodate people coming to the city from the Bay Area. Today it houses a food court and that is where we had lunch before hopping on a ferry to Alcatraz. The island started out as the first lighthouse and fort on the West Coast. From 1850 to 1934 it was a military prison and then from 1934 to 1963 it was a federal prison. 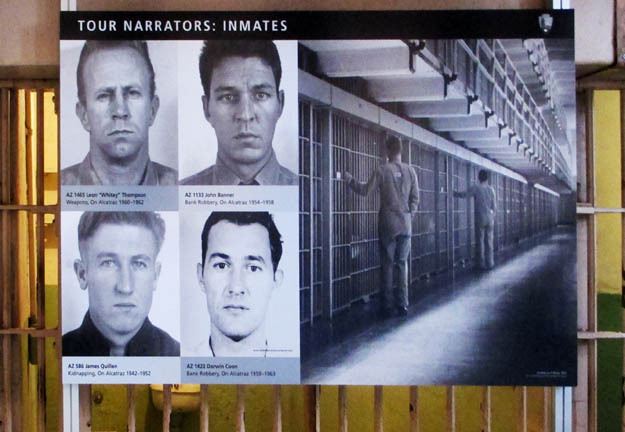 Only three men escaped from Alcatraz who were never caught. 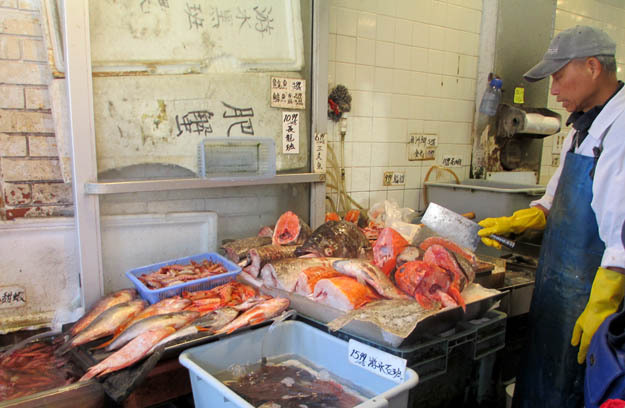 There is doubt that they survived the cold waters of the 1.25 miles to the mainland. Today it is a National Park. The audio tour was an excellent way to learn about the facility. Narrated by former prisoners and guards, the tour revealed inside perspectives of what it was like to be imprisoned there. Referred to as “The Rock,” I was surprised to see the lush gardens on the grounds. These gardens were started by the military families who lived on the island and were maintained by prisoners. The park system has restored them as they were. 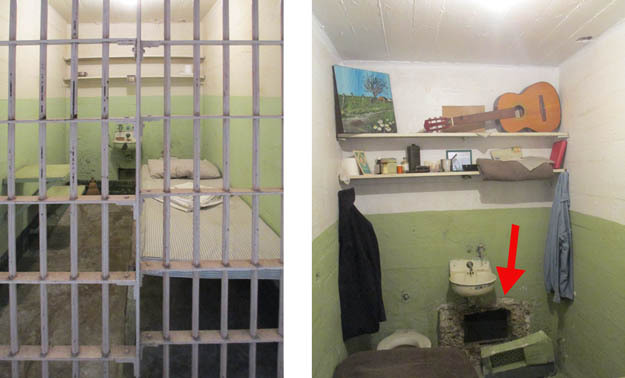 The prisoners occupied small, individual cells. 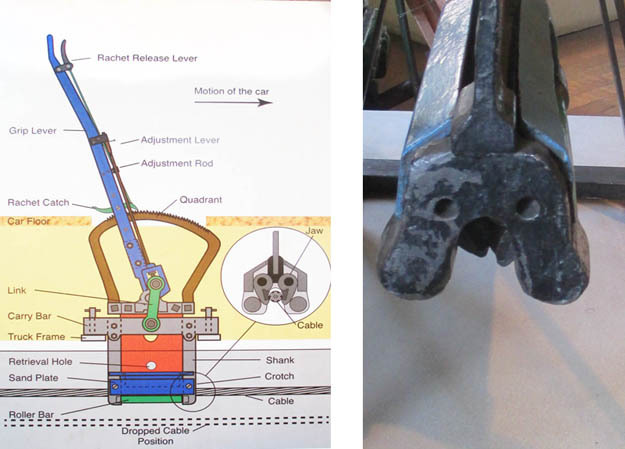 The photo on the right is one of the cells where an escapee removed concrete around the opening of a ventilation duct using spoons. 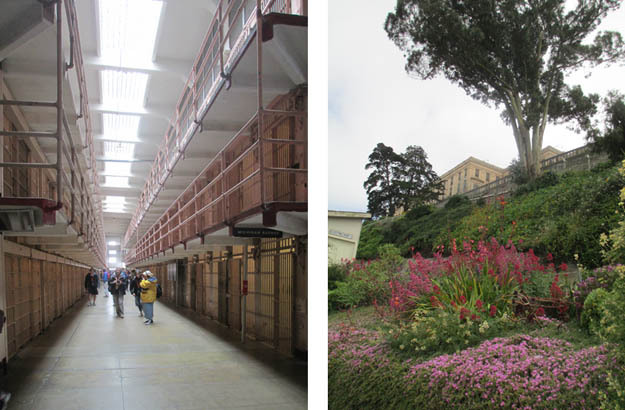 Visiting Alcatraz was a sobering experience! 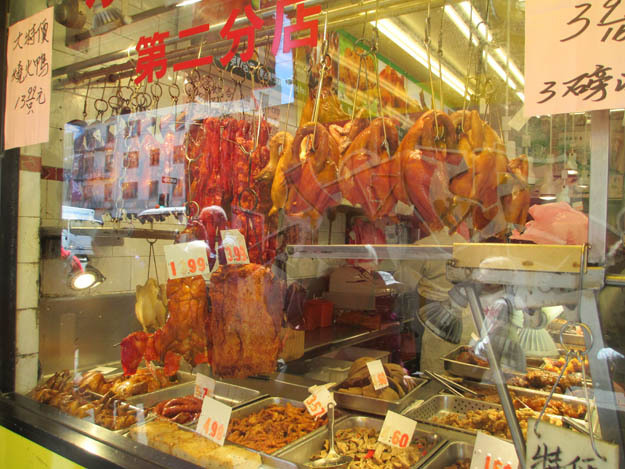 Yesterday morning we took a bus, then a street car to explored Chinatown where we visited streets and markets, a shop where fortune cookies were being made, a temple, a park, and then had dim sum. 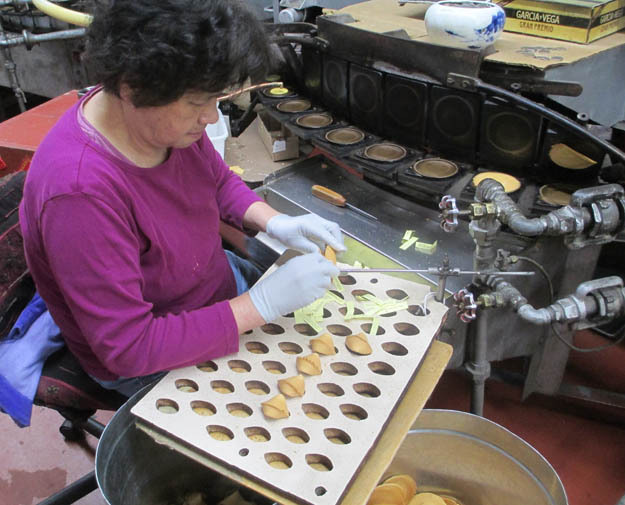 This woman is putting messages in fortune cookies hot off the griddle. 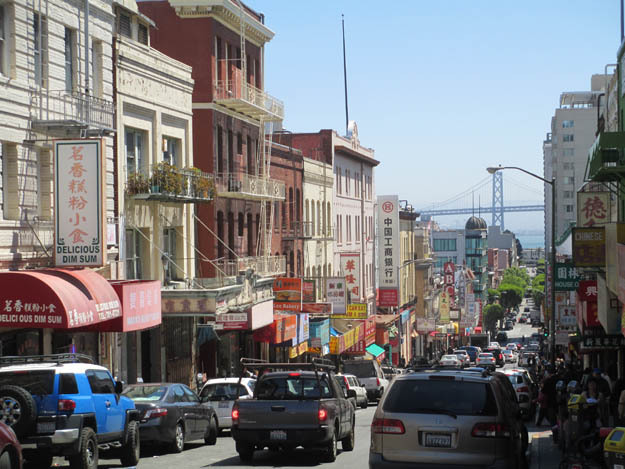 We have had very informative presentations about the history of San Francisco by experts on topics including the California gold rush that transformed a small settlement into the thriving and prosperous city of San Francisco over night. 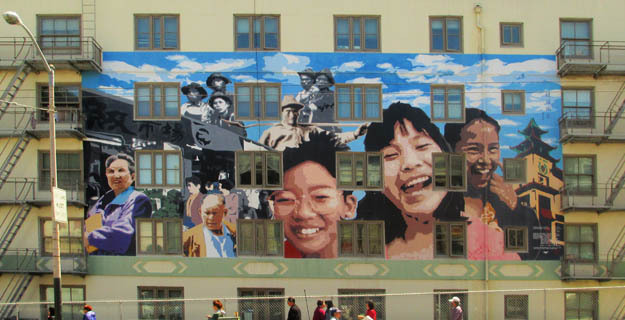 We have learned how the ingenuity of entrepreneurs rose to meet the needs of the miners and the mining businesses and created American institutions such as Wells Fargo, the Bank of American, the Central Pacific Railroad, Levi blue jeans, Hills Bros. coffee and Ghirardelli chocolates, etc. 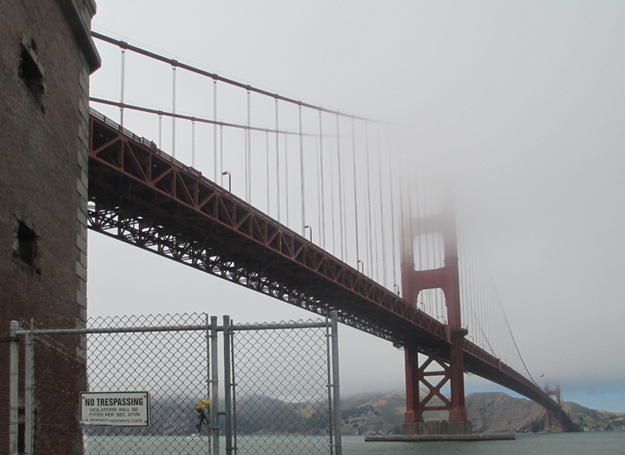 We have learned about the incredible engineering and construction project that resulted in the Golden Gate Bridge. 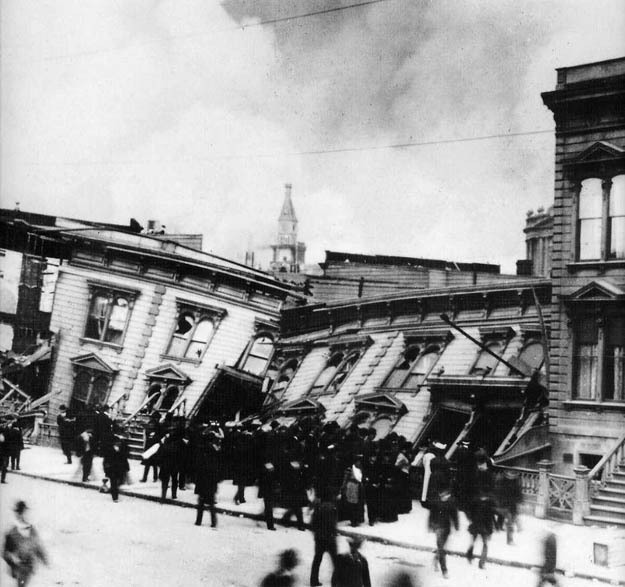 And then the horrendous earthquake of 1906, which lasted 53 seconds, and the mistakes that were made to deal with the fires, which caused even more destruction until the US Navy arrived 72 hours later and put out the fires. We were reminded of the Summer of Love in 1967 and today we will learn more. Before the trains, Wells Fargo provided stage coach transportation. The coaches typically carried 18 people and it cost $300 to travel from Omaha to Sacramento. 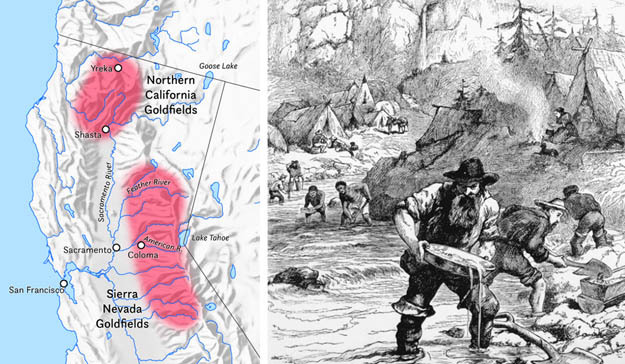 The established a network of coach routes throughout the west. 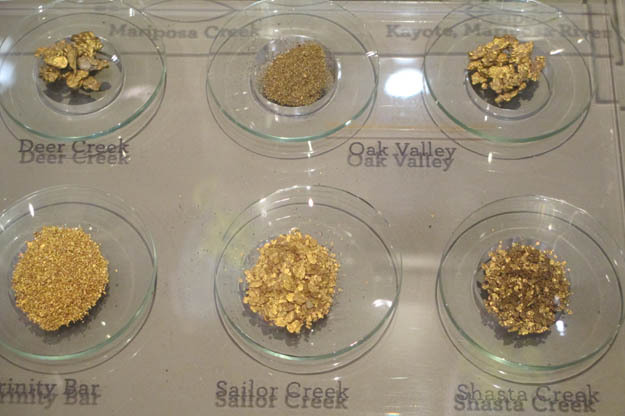 Wells Fargo also operated a bank where gold was converted to cash, but not all gold was the same. The quality varied from mine to mine. 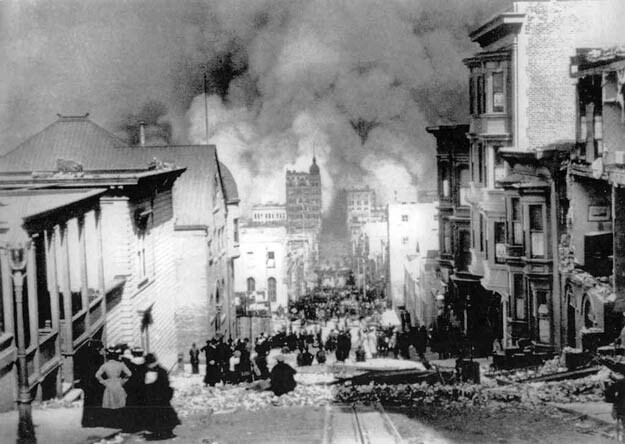 More than 3000 people died and 80% of the city was destroyed by the 1906 earthquake and resulting fires. Immediate aid came from all over the country as well as loans to restore all that was lost and damaged. This entry was posted in San Francisco 2017 on May 25, 2017 by JWH. 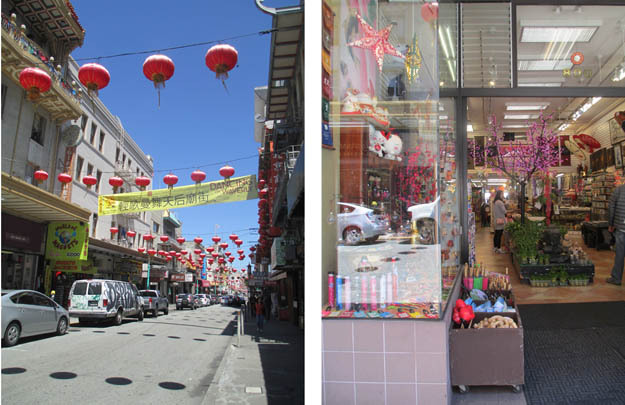 I am discovering San Francisco for the first time! Am spending five days visiting the city on a Road Scholars program and am off to a great start. Yesterday we were out and about from 8 am to 8 pm learning from three experts – an historian with a passion for understanding the history of the city through its interesting and quirky leaders, a woman who is the historian of San Francisco’s fabulous City Hall, and a guide with an expert knowledge of the various communities and its fabulous architecture. Here are some of the highlights for day 1. 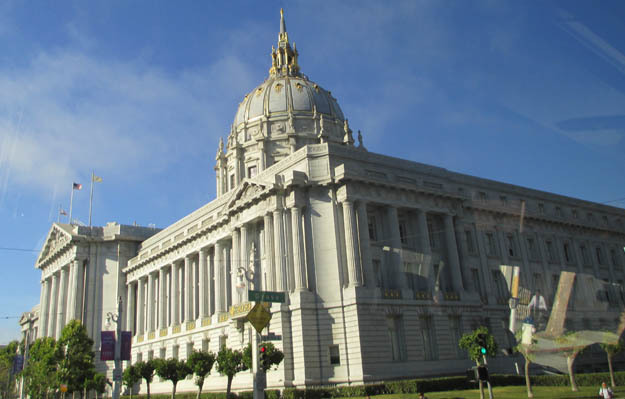 When the original city hall was destroyed by the 1906 Great Earthquake, civic leaders decided to rebuild an impressive structure as a symbol of the resilience of the City. It was built in two years, in time for a Worlds Exposition in 1915. The building occupies two city blocks and is topped by a dome that is 42 feet higher than the Capital dome in DC. While a wedding ceremony was taking place at the top of the stairs, a display of a dress, the Amsterdam Dress, was taking place below. 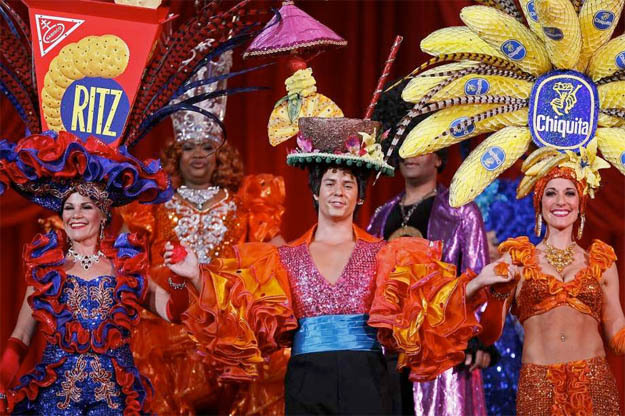 The dress is made of 75 flags of countries where it is a crime to be homosexual, including 12 countries where it is a crime punishable by death. 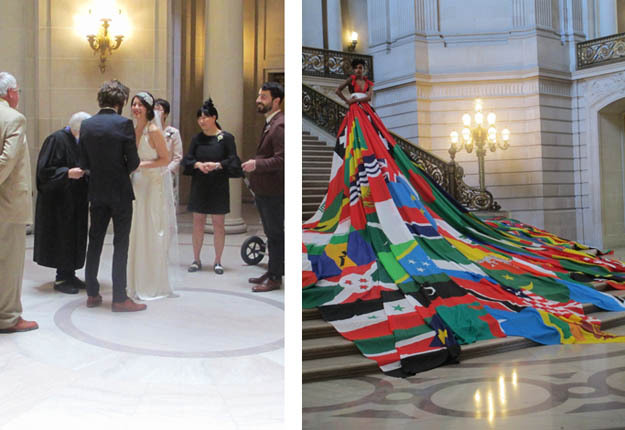 The dress was created in Amsterdam and is traveling the world promoting openness and inclusiveness. It measures 52 feet in diameter. 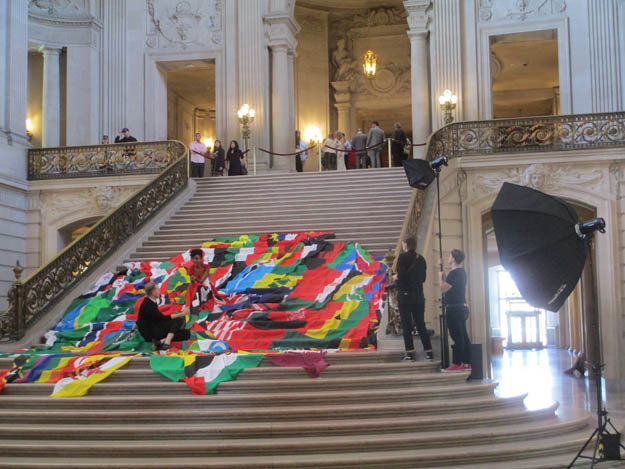 It was being displayed in San Francisco on the anniversary of the assassination of Harvey Milk. 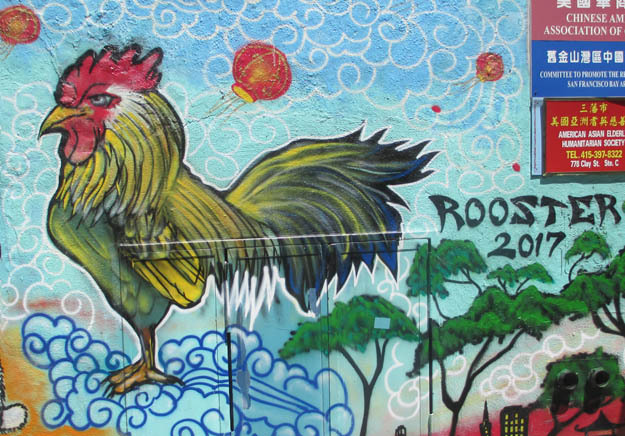 We toured part of the city gaining a sense of some of the neighborhoods. 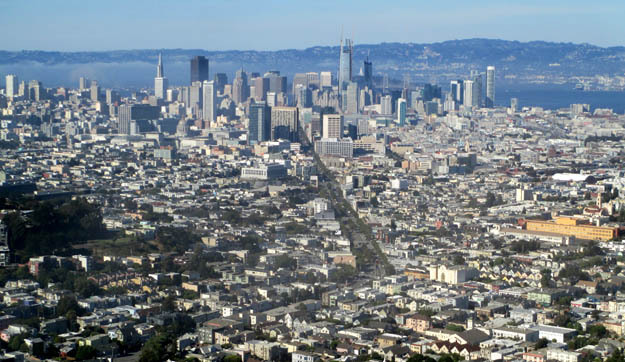 The photo below was taken from the top of Twin Peaks and shows how densely built up the city is with no more room for housing, which explains the high cost of property and rents. 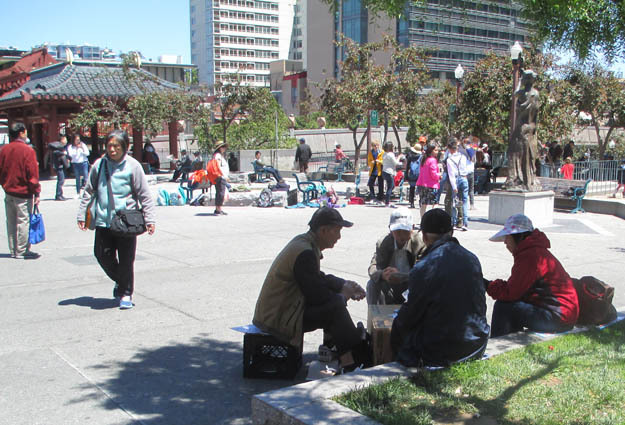 We were informed that there are more dogs in the city than children because families cannot afford to live in the downtown area. 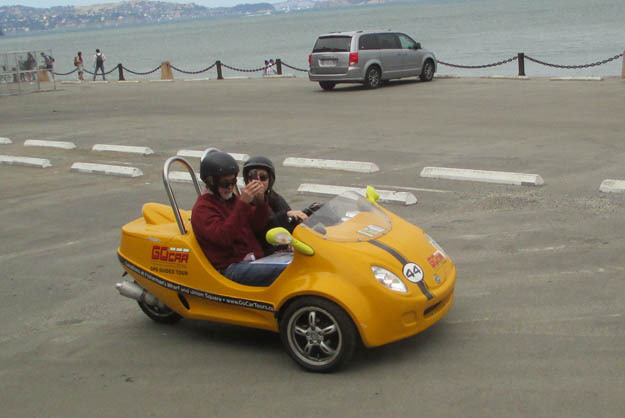 As we toured, I observed these tiny vehicles, GPS outfitted for rental to tourists. While these folks were navigating traffic, we traveled in the safety of a comfortable bus. As we toured parts of the city we experienced many micro climates where visibility and temperatures changed within minutes. 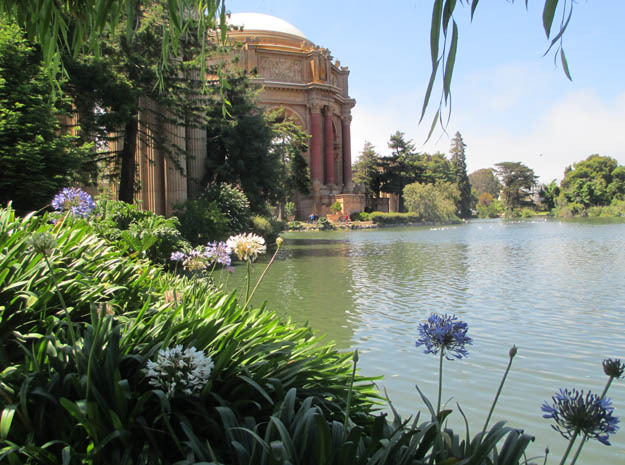 This is the Palace of Fine Arts, a structure with an exhibit hall built for the 1915 World Exposition. 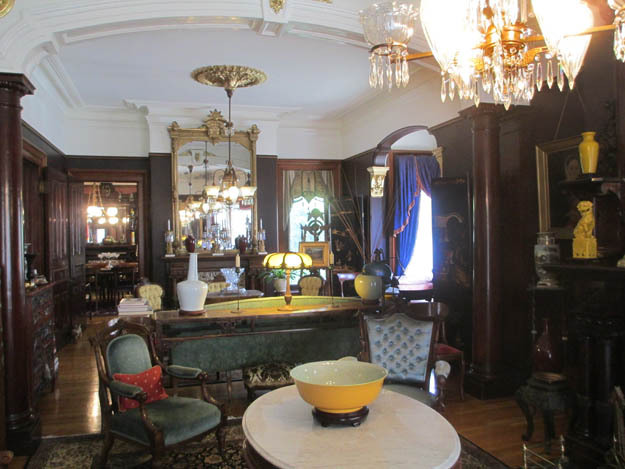 The Beaux Arts style of architecture was popular at the time and after the exposition, rather than tear it down, the city decided to keep it. Structural problems developed so in 1964, it was demolished and rebuilt with improvements. The scale of the structure is impressive! 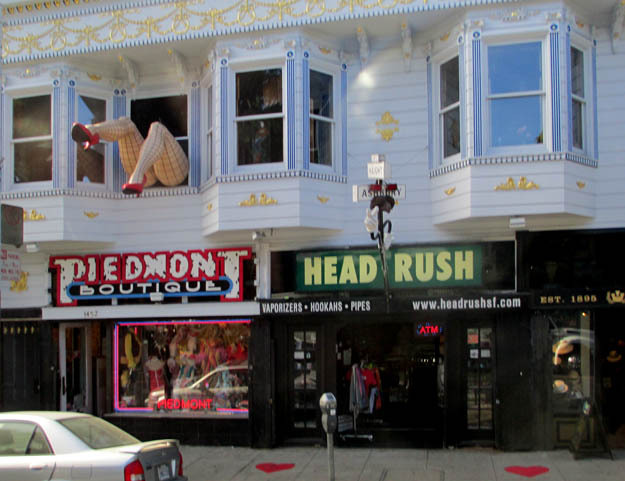 We visited the Haight Ashbury neighborhood where the 50th anniversary of the Summer of Love is being celebrated. 50 years – can it be that long ago!! 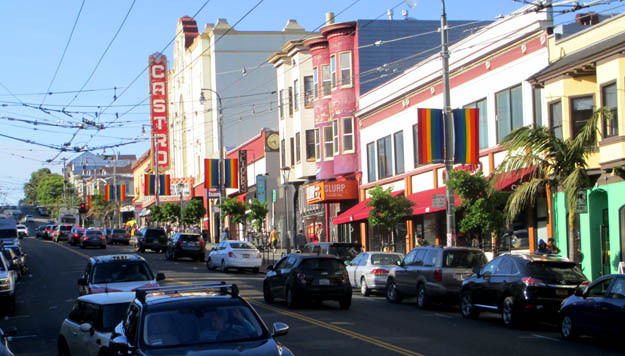 Another neighborhood we drove through is the Castro, the heart of the gay community. This entry was posted in San Francisco 2017 on May 23, 2017 by JWH.